With the recent spread of the Ebola virus, there’s an even greater awareness being brought to avoiding viruses and other illnesses while traveling. Cramped quarters and loads of people and germs means travelers are more susceptible to getting sick. After drinking Airborne pre-trip, those on-the-go may want to consider the new AirTamer , a unique personal breathing space air filter. The device can be worn around the neck, clipped to a shirt or blouse, attached to an armband or belt or placed on the nightstand while sleeping. The device can be worn and used more discretely and more fashion-forward than surgical masks! The AirTamer utilizes advanced ionic/electrostatic purification technology to create a cleaner zone of healthier air while traveling. AirTamer produces and emits healthy, negative ions, forcing harmful particles — airborne pollutants, bacteria, viruses, smoke, mold, dust, pollen and allergens — away, allowing users a cleaner breathing space. The device does not require a filter, and can run for up to 20 days on a battery. 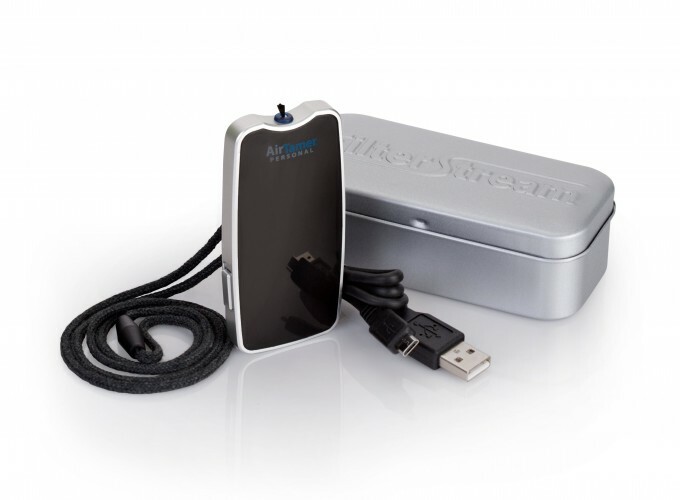 Travelers appreciate the AirTamer’s sturdy metal travel case. Purchase the device online, on Amazon , by phone at 866 625 3218 or at select retailers in North America for around $59.95.